A $2 million collaborative research grant from the National Science Foundation aims to improve the mathematical education of future high school teachers nationwide. 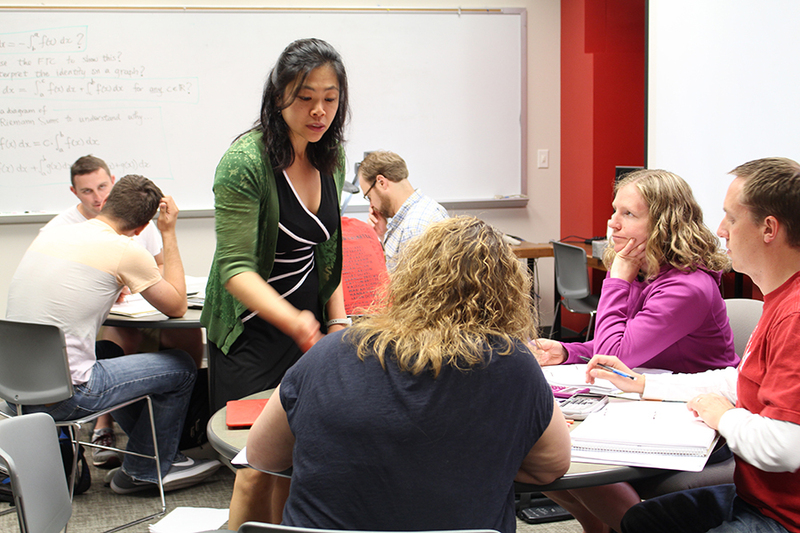 Yvonne Lai, assistant professor of mathematics at the University of Nebraska-Lincoln, is the lead researcher for this five-year grant, alongside collaborators from the Association of Public and Land-grant Universities, Eastern Michigan University, Middle Tennessee State University, the University of Arizona and Utah State University. Mathematics of Doing, Understanding, Learning and Educating for Secondary Schools (MODULE(S2)) will examine how courses for future high school math teachers are taught, create curricula in four specific areas and investigate the impact of instruction of these new modules on pre-service teachers’ knowledge, with the goal of informing nationwide efforts in teacher education. The curricula in algebra, geometry, modeling, and statistics will be piloted by more than 40 institutions over the next five years. At Nebraska, these materials will be tested in courses such as Math 407 and Math 408. To implement thorough mathematics instruction, evidence shows that teachers need to possess understandings of content that are specifically applied in the work of teaching, referred to as mathematical knowledge for teaching (MKT). To develop MKT, pre-service teachers need opportunities to use mathematical knowledge to recognize, respond to, and understand mathematical issues that arise in the context of teaching. MODULE(S2) will research the conditions of instruction that impact pre-service teachers’ MKT, development of MKT, and expectancy and value in using MKT as a resource for teaching. This project builds on efforts by the Mathematics Teacher Education Partnership. Also, the Robert Noyce Teacher Scholarship program is providing co-funding for MODULE(S2) in recognition of its alignment with the broader teacher preparation goals of the Noyce effort.